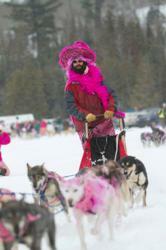 While other dogsled events may have had to cancel or re-route their teams this year due to lack of snow, the Mush for a Cure has perfect winter conditions for the event that has raised over $100,000 for the National Breast Cancer Foundation since it's inception. Folks in Cook County have been seeing lots of white falling from the sky but it won't be long and they'll be seeing pink and plenty of it. The 6th Annual Mush for a Cure activities begin on Friday, March 9th at Windigo Lodge. The "Bald, Brave and Beautiful will take place after the pasta feed at Windigo," says organizer Mary Black. "We have District Ranger Dennis Neitzke getting his pink hair shaved off for the cause. It's pink because he raised over $2500 in pledges!" Saturday the Mush for a Cure Skijorers and short course participants will begin their trek at 10 a.m. while the bigger teams will wait for their Sourdough Start at noon. "They will be lined up in their sleeping bags without their boots on waiting for the shotgun to sound, it's quite an amazing scene," says Mike Prom who helps organize the event. The teams will make their way to Trail Center on Poplar Lake where there's even more fun planned. A Human Dog Sled Pull and Captain Jack Sparrow will help keep folks entertained as the dog teams cross the finish line. Saturday evening there will be a sky lantern tribute at dusk. Folks can purchase sky lanterns and dedicate them to someone before sending them off into the dark night sky. It should be a spectacular sight to see. There's live music and dancing at Windigo on Friday night and at Trail Center on Saturday night. There's plenty of snow for all of the fun activities planned for the 6th Annual Mush for a Cure Sled Dog FUNdraiser.